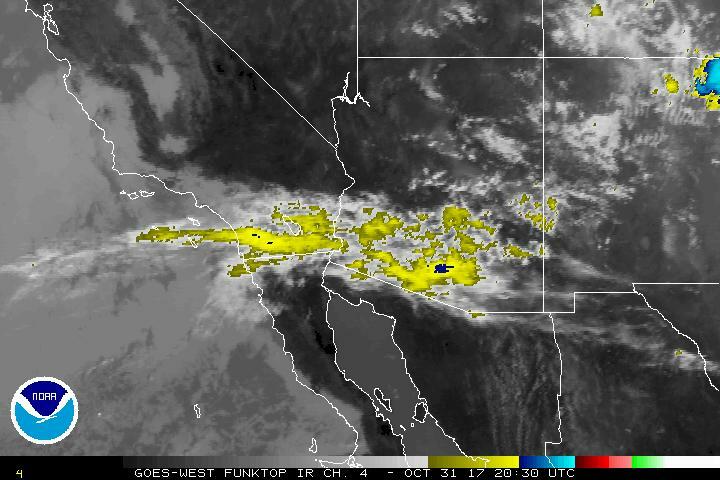 Turned into a gray and dreary day as middle and high clouds have been streaming by from the Pacific since mid-morning - as per Catalinas view above and latest IR image below. Edited to add: Ron Holle just sent e-mail as per - 0.55" at his place in Oro Valley, with some small hail, between 10:00 and 10:30 pm. Nice cool morning at sunrise today, with some middle to high clouds around (top and bottom), with some pink virga streamers to the southwest. Thundertorms skirted most of metro last night, as per 12 hour CG flash density (above) for 12-hours ending at 6:00 am MST - storms to north, east, and south of city. 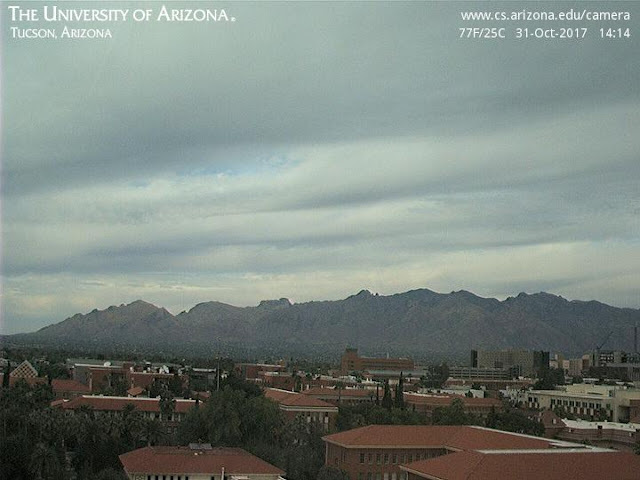 The ALERT network did capture some rainfall, in and near the Catalinas, particularly just north and northwest of Oro Valley, where a half to three quarters of an inch fell. Here at house we had a nice smell of rain, but nothing in the gauge. Davis Monthan had thunder and much of far southeastern Arizona had light amounts - the two ALERT measurements near Oro Valley were far and away the largest amounts I found. The gauge with 0.75" recorded the rain between 10:00 and 11:00 pm (above), and the Phoenix radar (KIWA) image for 11:00 pm is shown below. Here is the ALERT network 30-day rainfall showing almost all of the month's rain fell last night. First, at 168-h the ECMWF forecast (above) was very bad and much inferior to the GFS. Apparently the GFS latched on to the downstream impacts of Super Typhoon Lan earlier than did the European model. The ECMWF 500 forecast at 120-h (below) had the heights over western Great Lake area better but had not closed off a cyclonic circulation yet. The ECMWF was also a bit fast. The system did bring snow to Minnesota and northern Wisconsin, as well as very cold temperatures over the Dakotas this morning. Overall, my subjective assessment is that the NWS GFS performed better than the ECMWF through this entire period. This morning's headline in the Tucson Star newspaper highlighted the October dryness, and also warmth. 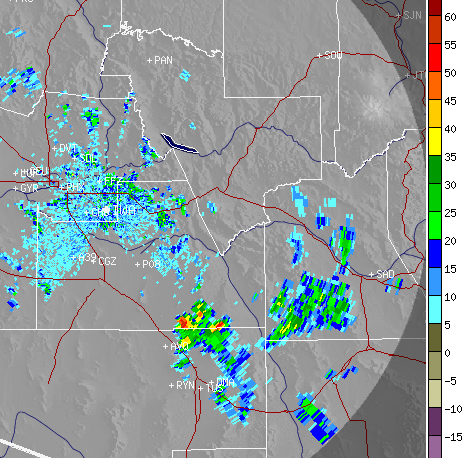 However the story also shows how variable precipitation can be across metro Tucson. While the airport has only had four years since 1948 with no rainfall, Here on the dry north side of the City, I have measured no October rainfall four times since 1999 (1999, 2005, 2010, and 2013). Quite a difference, perhaps the NWS stats included months with a Trace as having rainfall? Wettest October here at house was in 2000, with 5.06 inches - quite a range. As for the rest of the month the forecasts are not good - above graphic shows QPF plumes for the airport through Monday evening (from SPC SREF - Short Range Ensemble Forecast system). There may be a weak system moving across Arizona on Halloween, which might bring a very slight chance of a treat. Photos below are from the campus web cam hourly views of the Catalinas for the past week - I don't see a single bit of cloudiness. As for the warm temperatures - our HVAC people are about to show up for the annual check of our heating systems, but the air conditioning continues to be running each afternoon - still! The extended period of no rain continues, and model forecasts at longer ranges indicate that the month may close out with absolutely no rain. Easterly winds during the night kept temperatures very mild, as would be expected. The low at NWS was 70 F (15 F warmer than yesterday), and 68 F here at house (20 F warmer than yesterday). The NWS late afternoon forecast valid at the airport grid point was for a morning low of 61 F - significant difference that shows the difficulty of certain parameter forecasts even under benign synoptic patterns (also see below re winds). However, the 12 UTC WRF-GFS forecast yesterday morning was very accurate - above graphic shows the model's 24-h forecast valid at 5:00 am this morning. The winds have gusted into the 30s (mph) at the airport at times since yesterday; however, the winds at Mt. Hopkins have been lighter (gusting only briefly to 31 mph yesterday) than indicated from the model forecasts from 00 UTC Sunday evening. This illustrates again the dangers of trying to make a specific point forecast too far in advance. The Sunday evening forecast sounding for Sonoita indicated strong easterly winds up to around 700 mb. But this morning's TWC sounding and the the WRF-GFS forecast sounding from 12 UTC yesterday morning (below, valid at 5:00 am MST today) show a much shallower layer of easterly winds. So it goes. Finally, back to following the GFS and ECMWF forecasts for 500 mb valid at 00 UTC on the 28th of October. These are the 72-h operational forecasts valid at that time from last evening (above is GFS and ECMWF below). There are still some important differences, even at this close range. The ECMWF is a bit slower for the closed low over the upper-Midwest than is the GFS. Specfic point differences are: at the Four Corners - GFS 5700 m and ECMWF 5760 m - and at Chicago - GFS 5400 m and ECMWF 5520 m. The heights over the upper-Midwest are important, since this system could bring the first snowfall of the season for places like Minneapolis and Milwaukee. Will check back in future post to see final numbers and weather for 00 UTC on the 28th. Plot of SPC 500 mb analysis above is from 12 UTC this morning. The 500 mb heights over most of the far west U.S. are at 5940 m and higher. A quick look at the sounding climatology page at SPC shows many of these heights to be near or at record levels for the entire period of sounding records. Santa Ana winds are blowing already in southern California, setting up a critical fire weather situation. Temperatures are expected to be in the 90s during tonight's first game of the World Series at Los Angeles. 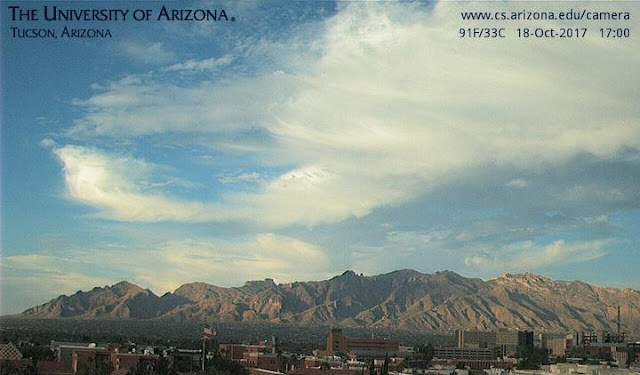 Very clear and cool this morning, as per view of Catalinas above at sunrise. The morning low here was 46 F vs 57 F at the airport. The NWS grid point forecast for airport indicates high this afternoon of 97 F - so big diurnal swing indicated by the early morning forecast. As high pressure builds over the West and Plains, we get a another backdoor front from the east. The 06 UTC WRF-GFS forecast of 10 m winds (below) indicates 20 mph and greater wind speeds over much of southeastern Arizona at 3:00 am MST on the 25th. The model's forecast sounding for Sonoita indicates wind gusts of up to 50 mph, or a bit higher, are likely at the Mt. Hopkins RAWS station from tomorrow afternoon through early morning on Wednesday. I took a look this morning at the global model's operational, 500 mb forecasts again - both from 00 UTC last evening and valid at 00 UTC 28 October (above at 120 h. The same forecasts from both models shown below at 168 h - the ECMWF was clearly the loser wrt the GFS during this 48 h period - shifting toward the earlier GFS forecast with height forecast changes of +300 m at the Four Corners and height decreases of about 200 m at St. Louis. I'll do this comparison again from 00 UTC on the 25, but right now kudos for the GFS. I have been watching the longer-term forecasts toward the end of the coming week. The ECMWF operational model has trended westward with the large 500 mb trough forecast by 00 UTC on October 28th (above). The shift west and southward was quite abrupt between the 12 UTC runs yesterday morning and the 00 UTC run last evening (above). However, the GFS ( same forecast below, also from 00 UTC) has continued to be very progressive with the trough. It is interesting that at this time frame the ECMWF 500 mb heights over the Four Corners are 300 m lower than those in the GFS forecast (300 m is a really significant difference). So again we'll have to watch how both models trend as the week evolves. The 00 UTC GEFS spaghetti plot for 500 mb (above) indicates considerable uncertainty for western U.S. and eastern North Pacific. Super typhoon Lan (IR image below, from about an hour ago) seems headed toward Tokyo, and may be a wild card player in the longer range forecasts. Last two days have provided some clouds after five days or so of mostly clear skies. Top is view to north from campus last evening. The cloud band over the Catalinas moved eastward (above) and was colored by the setting sun. This morning, as a weak short wave at 500 mb approaches, there were some build-ups at sunrise (below) off to the northwest. Alexander B. Prescott posted a comment to the previous post about an Atmo seminar this Thursday, and I thought I should highlight it here. As for our very dry October - above is the 06 UTC GEFS ensemble forecast plumes for precipitation at TUS out through the 25th - not good. Very dry October continues with little hope for precipitation indicated by forecast models. Was very mild at sunrise today - currently at house it's 70 F vs 50 F yesterday, and looks like airport low will be 71 F. Surface plot above from 7:00 am MST indicates anticyclone center at southeast corner of New Mexico. Winds gusted to 41 mph (below, with gust speeds indicated in far right column) at the Mt. Hopkins RAWS site during the night, illustrating again the usefulness of the WRF forecast sounding at Sonoita. The GFS forecast has come into sync with the ECMWF, and both models now forecast next short wave at 500 mb to move rapidly across the Southwest, before closing off over Texas. Cool morning here with low of 50 F at house and noticeably cooler down along the Rillito - very pleasant given the hot afternoons. Strong pressure gradients with front moving westward across southern New Mexico will bring east winds later today. Sea-level pressures are over 12 mb higher over southeastern New Mexico than here in Tucson note the gust to 48 mph at Guadalupe Pass (above - 7:00 am MST surface plot). The lightning report from White Mountains is a bad observation. The 06 UTC WRF-GFS forecast skew-T for Sonoita at 1:00 am tonight (below) indicates that winds may gust from 30 to 45 mph at the Mt. Hopkins RAWS site tonight. In the longer term, the operational ECMWF (above) and NWS GFS (below) are both forecasting the tail-end of a short wave to dig into the Southwest next weekend - both forecasts valid at 5:00 pm next Saturday. The last several days the ECMWF was forecasting this feature to close-off over Arizona, but has now become progressive. However, several of the GEFS members forecast a closed low over Arizona at this time. So, we'll watch to see which model prevails. Couple of shots here from Mesa Verde NP. Above is highest peak of Sleeping Ute Mountain looking west-northwest from Wetherill Mesa. Below is looking west from the visitor center at the entrance to the NP. Very Dry Period Continues; For How Long? The very dry period continues, since beginning on August 13th - just over a quarter of an inch here in that period. The 168-hour, 500 mb GEFS spaghetti plot above is valid at 5:00 pm on October 20th and provides little hope for relief here in southern Arizona. There is little spaghetti at this long range, and that is over Europe and the Middle East. Models predict that we stay on the windy and dry side of the trough over the Northwest. We've been away the past week on a road trip to the Four Corners region, and included time at our favorite hotel, La Posada, in Winslow. Even though it's October, the large cottonwoods there had only a slight hint of yellow. However, some other varieties were turning and providing very nice Fall colors. The temperature there was below freezing on Tuesday morning, the tenth, but the sprinklers were still on - as per icicles on the tree shown at bottom.